Veterinary laser therapy not only provides relief from pain and swelling, but provides a method of healing wounds and injuries by stimulating acupuncture points and causing the release of endorphins. It is also used to resolve many persistent dermatological disorders by accelerating tissue repair and cell growth. Veterinary laser therapy can be a very effective choice for elderly patients and other pets who cannot tolerate invasive or pharmaceutical therapy. 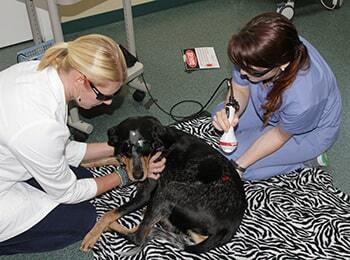 Your pet will be very comfortable during laser treatment. It is safe and quick, requires no anesthesia, taking only 5 minutes or less per site. You may notice some improvement in your pet’s condition after the first veterinary laser therapy treatment, but the benefits are usually cumulative. Multiple treatments offer the greatest benefit. Our Charlottesville veterinary staff will be happy to set up a treatment plan to meet your pet’s specific needs.